to bring free dance lessons by the Alvin Ailey American Dance Theater to the historic Eighteenth and Vine District. Juneteenth in Kansas City grew throughout the 1980s before a period of decline in the early 2000s. In 1990, the ten-year anniversary of the modern Juneteenth celebration in Kansas City, the Kansas City Star noted that the first Juneteenth commemoration in 1980 included 200 people, though another article from 1991 puts the number closer to 1000; the newspaper reported attendance of roughly 25,000 in 1990. Horace Peterson passed away suddenly in 1992. Without his guidance, Juneteenth slowly died off in the late 1990s. Festivals in the historic Eighteenth and Vine District in the early 2000s focused less on African American culture and independence and more towards music and food. n for giving back to the urban core. Her mother, Barbara Peterson, was serving on the board of the Black Archives of Mid-America at that time. Makeda visited with community members about the value of Juneteenth to the wellbeing of the African American community in Kansas City. Juneteenth was clearly a source of pride, and the broader community felt its absence. Since Horace Peterson was so central to making Juneteenth an important part of African American life in Kansas City, Makeda felt personally motivated to get back involved in the Juneteenth commemoration. JuneteenthKC successfully organized and held Juneteenth festivities in 2012. JuneteenthKC, now a 501c3 organization, collaborates with other organizations and city departments to reenergize and grow the Juneteenth commemoration in Kansas City. For example, in 2017 Juneteenth expanded to include activities at the Nelson-Atkins Museum of Art for the first time, including artist demonstrations. Renée Stout discussed cultural appropriation and the role of the creative process in healing and empowerment. Juneteenth in Kansas City in 2018 consisted of a number of components, with activities occurring over the whole month of June. The 2018 theme was “Passport to Freedom.” JuneteenthKC kicked off the celebration on June 1 – First Friday – in the historic Eighteenth and Vine District. The evening included fire-breathers, large puppets, and face painters, but it also highlighted Black businesses in the District. The Juneteenth parade – the second organized by JuneteenthKC – occurred the next day and included fifty entries, many of which promoted Black businesses and organizations. The parade brought approximately 1500 people to the Eighteenth and Vine District. Dr. Mark T. Bedell, superintendent of the Kansas City, Missouri, School District, was the Grand Marshall. Benny Shelby, who owns the Kansas City Blues and Jazz Juke House in the Eighteenth and Vine District, was Mr. JuneteenthKC. Melissa Robinson, president of the Black Health Care Coalition, was Ms. JuneteenthKC. There was an after-event at the Gregg-Klice Community Center, which brought back the drill teams for additional performances. The following weekend, on June 9, the Nelson-Atkins Museum of Art commemorated Juneteenth with a series of activities, including a conversation with African American sculptor Ed Dwight, artists’ demonstrations, and storytelling; this was a partner event with JuneteenthKC, which helped to market the event to the community. Finally, the next weekend, was the Juneteenth Heritage Festival. There were over seventy-five retail vendors, over fifty health service providers and non-profit vendors in the Gregg-Klice Community Center, and then a main entertainment stage hosted by MetroPCS and the Kansas City Neighborhood Tourist Development Fund that had local acts, live musicians, and a gospel show. JuneteethKC has continued the tradition started by Horace Peterson of including educational and health services in the Juneteenth commemoration. During the 2017 Juneteenth commemoration, Truman Medical Center’s Health-Mobile gave out free bags of groceries, the Kansas City Health Department provided free vaccinations to children and adults, and a blood drive occurred at the American Jazz Museum. JuneteenthKC often waives fees for vendors who can bring in health and wellness services to the community. JuneteenthKC also added a swim campaign to the Juneteenth commemoration in 2017. JuneteenthKC worked with Kansas City Parks and Recreation to highlight the importance of swim education in youth and adults by giving away 500 free swim lessons. The “Make a Splash” is important to Makeda, since her father died in a drowning accident. The goal of the swim campaign is to help people understand the various environmental elements that affect our experience with water. In 2018, free swim lessons were again available at Gregg-Klice. Diuguid, Lewis W. “Juneteenth is finding its voice.” Kansas City Star, 6 June 1991. “Nelson-Atkins Focuses on Emancipation with Juneteenth Celebration.” Dispatch Post USA, 18-24 May 2017, p. 2A. Penn, Steve. “Juneteenth celebration to feature loads of jazz.” Kansas City Star, 15 June 1990, p. C4. Sweeney, Michael. Interview with Barbara Peterson and Makeda Peterson. 6 July 2018. 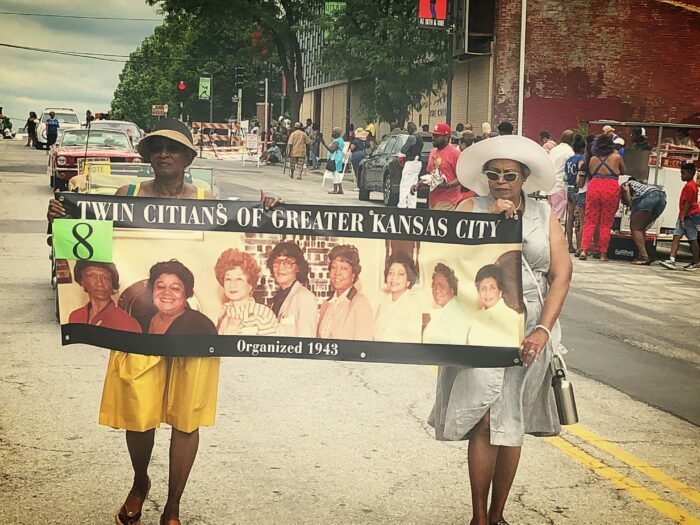 1 – Twin Citians of Greater Kansas City in the 2018 Juneteenth Parade. 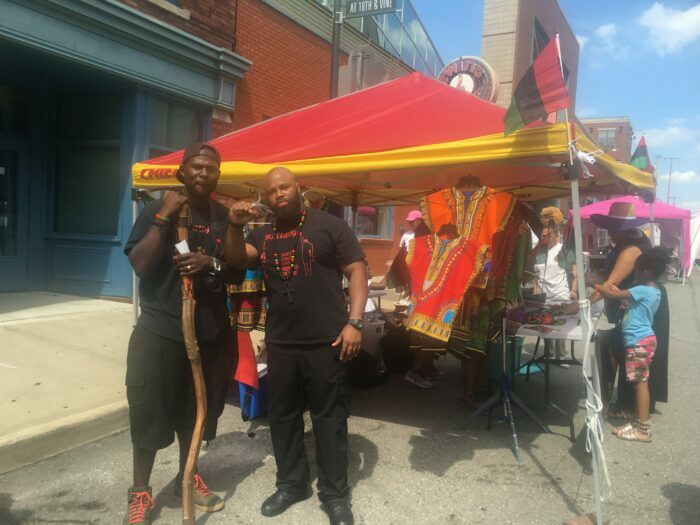 2 – Building BLACC at the 2016 Juneteenth Festival in Eighteenth and Vine Historic District. 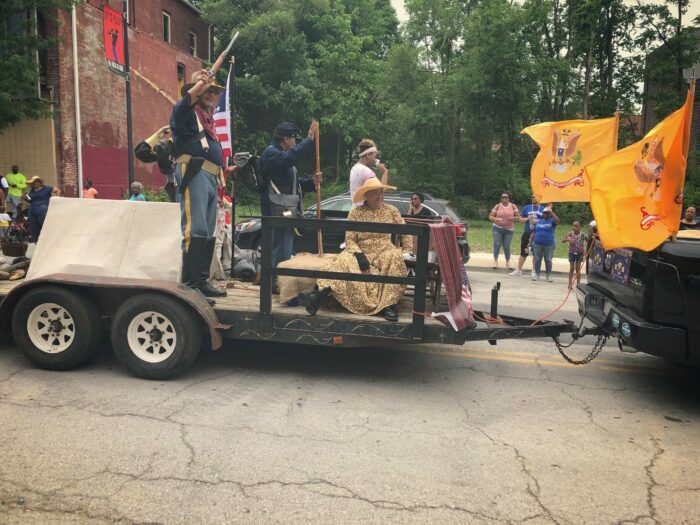 3 – Buffalo Soldiers float in the 2018 Juneteenth Parade.